African Penguin, Spheniscus demersus, is also called the Blackfoot penguin. This penguin is found off the coast of southern Africa. Penguins are birds that cannot fly, but penguins swim very well and spend most of their lives in the sea. African penguins can swim at a speed of about 4.3 to 15 miles per hour (7-24 kph). This penguin makes a sound like a donkey. 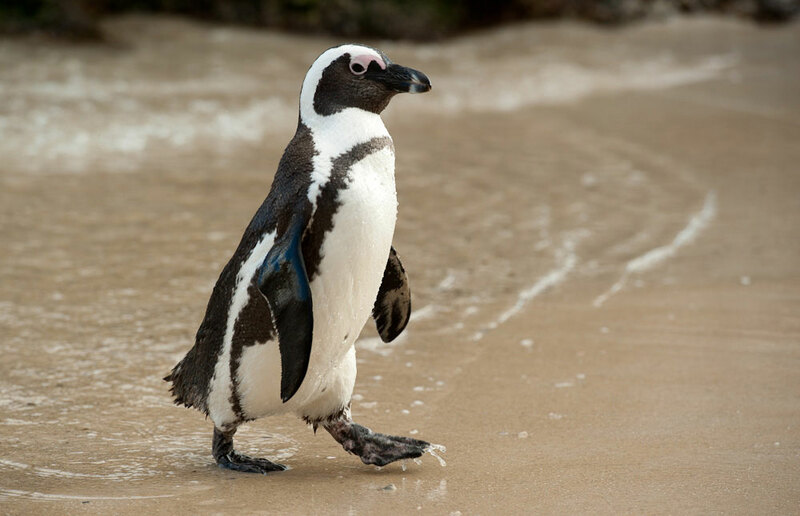 The African Penguin lives in colonies on 24 islands between Namibia and Port Elizabeth (Africa). New colonies have been established on the African mainland. Penguins have shiny, waterproof feathers that help keep their skin dry. They have more feathers than most other birds – about 70 feathers per square inch. Once a year, penguins molt, losing their old feathers and growing new ones. While molting (which takes about 3 weeks), they cannot swim and do not eat.